I spend about 45 minutes per day in my car. I spend another 30-60 minutes per day working out, often with headphones on. In the past month, 100% of that time has been spent listening to two regular guys (they say that a lot) named Brad and Jonathan who run a podcast called ChooseFI. Apparently, they have a website too (check it out here) which I had never visited until recently. Oddly enough, I’ve spent about 15 hours listening to these guys but have never seen a photo of either of them. I was surprised to find that they both look exactly as I had pictured them in my mind, so yeah, I guess they are pretty authentic on the podcast. I’m not usually a huge podcast listener. As I’ve documented before, I listen to a lot of audiobooks. I stumbled across ChooseFI when my buddy Logan shared it with me. I listened to the first couple of episodes on my commute and I have not listened to anything else since. There are a few reasons that the podcast is incredibly helpful to me. It ensures that the voice inside my head is constantly thinking about financial independence. By spending 30-60 minutes per day listening to the stories, tips and hacks of other people walking this path, it keeps it top of mind for me throughout the week so I can always keep it as a focus and priority. It validates and puts a structure to a lot of the things that I was already doing or thinking. It has introduced me to a TON of new ideas, hacks, actionable tips and tools that I literally started doing immediately. There have been times when I have opened a different app on my phone and taken action that second based on the discussions that Brad and Jonathan have. Please note that I started at the beginning and listened to the show in chronological order, so I’m still pretty far behind current episodes. This is probably the best assisted epiphany that I’ve had from listening to ChooseFI. I’ve always focused on increasing my income and increasing my savings rate as the two main variables. However, after listening to some of the episodes like the one with The Millionaire Educator, I came to the simple but important realization that not all dollars are equal. I’ve had way too much of my money sitting on the “wrong side of the ledger.” This means that I have dollars that could have been tax free, but I’ve been paying taxes on them. I started maxing out my 401k, Roth IRA, HSA and getting education and charitable tax credits here in Arizona. I’m not perfect, but it’s definitely a start on my way to Mad Fientist territory of really taking advantage of tax laws. This is one that I had already committed to a couple years ago, but had to mention because of the awesome way that Johnathan described cable. I won’t get the quote exactly right (and I’m too lazy to go back and find it), but it was some more concise version of “why would you pay every month for a company to constantly pipe advertising into your home?” Brilliant. I always thought I was a fraud for not heeding Dave Ramsey’s advice. I’ve used a Southwest Rapid Rewards Credit Card for four or five years and always paid it off on time. I get a few free flights a year and thought that was the end of it. Nope. I never truly understood what “travel hacking” or “travel rewards” even meant until Brad explained it. I didn’t realize that it wouldn’t kill your credit. I didn’t realize how much free travel you could actually earn. I didn’t realize how easy it is. This is probably the biggest eye opener for me since listening to ChooseFI. I have always felt a bit like an impostor in the financial independence world. The heroes in this space are minimalists with only 53 possessions, vehicle-free mustachians who bike everywhere, penny pinchers with a $4 monthly grocery bill, or 26 year-old retirees who blog from their Airbnb in Singapore. Most of my accomplishments are limited to maxing out my 401k, picking up a side hustle or two, or decluttering my garage a bit. Listening to ChooseFI has helped me realize that it’s important to learn from those who are successful, but to choose your own path to financial independence. I am probably always going to have a car. I will probably eat at a restaurant again. I will most likely pay more than $100 in income taxes this year. I might only bike to work one day per week. However, I’ve learned how to pick up and apply the strategies that work for me, so on the whole, I can be much closer to financial independence and early retirement. This is still a huge accomplishment, even if it doesn’t make me the poster boy of the FI community. I already had most of my funds in a Vanguard Total Stock Market Index Fund, but in the back of my mind, I toyed with the idea that I am smarter than the rest of the world and I can beat the market. Every once in a while, I test this theory with small amounts and end up back at the same starting line. Listening to the logic behind the ChooseFI guys’ choice to go with low-cost index funds makes me realize how futile it is to spend any time trying to beat the market. Save. Automate. Invest in index funds. End of lesson. The concept of “second generation FIRE” is another one that hadn’t really occurred to me. Rather than hopelessly socking away money in my child’s college fund, these guys have introduced a few concepts that help me look at paying for education differently. Programs to get credit while in high school, hacking the FAFSA and even geo-arbitrage are all game-changers when it comes to our plans for sending our daughter to college . This is another area where I’m excited to dig deeper. I always figured that if my wife and I were eating at home, it’s probably a good decision. This is true, but we can do way better. The Costco Meal Plan and the $2 per person per meal goal are simple, achievable ways to cut our spending on food. We have already made huge progress in reducing our monthly food budget. I am a fairly private person. I completed an Ironman and qualified for the Boston Marathon, rarely telling a soul beyond mentioning that “I’ll probably go for a run this weekend.” I don’t talk to a lot of people about my personal finances. Most people don’t even know that I have a blog. Johnathan and Brad discussed their personal fitness goals, among other things, very publicly and committed to achieving certain milestones. I’ve been able to listen to their progress over time with running, pullups, weight loss, and of course, FI. They have made me realize that the best way to commit to and achieve a goals is to publicly commit to it so you are 100% on the hook to achieve it. When other people are asking you how you are making progress toward your goal, you are way more likely to stick with it. This is something that I have already started, specifically around growing my blog and side businesses. 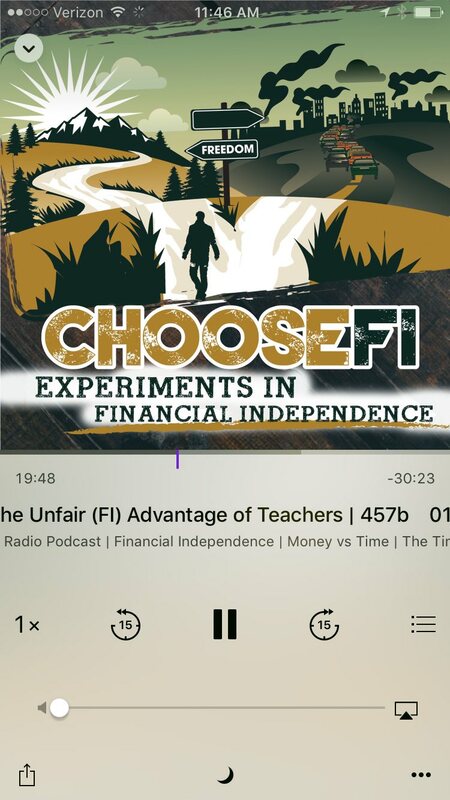 I’m looking forward to listening to the next few months of archived episodes of the ChooseFI podcast and following the hosts. If you want to check it out, you can find the ChooseFI podcast on iTunes or wherever you go for podcasts, or you can check out their website at ChooseFI.